Vandal throws stones, breaks windows of Sofia Central Synagogue on Shabbat, days before International Holocaust Remembrance Day. 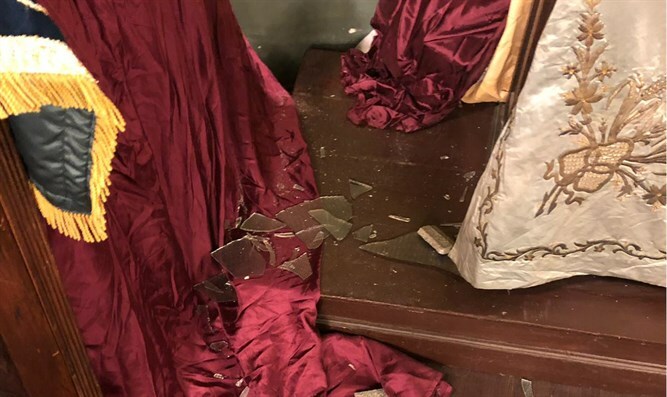 A synagogue in Sofia, the capital of Bulgaria, was attacked Saturday by an unknown vandal who threw stones at the synagogue and smashed the building's windows. The assailant broke the windows of the Great Prayer Hall of the Sofia Central Synagogue on the capital's Washington Street. 'Shalom,' the organization of the Jewish community in Bulgaria, noted that the attack took place on the Shabbat and several days before International Holocaust Remembrance Day on January 27. “The incident itself is extremely troublesome, but the complete lack of reaction by passersby on the street is even more worrying,” Shalom president Associate Professor Alexander Oscar said, the Sofia Globe reported. “The safety of the community is at the moment the most important and we will work together with the police and the relevant institutions in the country to guarantee it. It was unacceptable that in Bulgaria, the language of hatred already had physical manifestations with direct attacks on Jewish communal property," he said. The Jewish community is also preparing for the Lukov March, which will be held in Sofia on February 16. The march is held annually in honor of General Hristo Lukov, a Bulgarian leader during World War Two who supported the passing of the Bulgarian version of the Nuremburg Laws and the deportation of Jewish citizens to Nazi death camps. The Lukov march draws hundreds of neo-Nazis every year. Last year, the World Jewish Congress petitioned Bulgaria's Prime Minister Boyko Borisdov to cancel the parade, but despite this effort, the parade was not canceled and will resume again this year. In response to the latest attack, World Jewish Congress Chief Executive Officer Robert Singer said: "This is yet another case of a real damage to the physical security of Jewish communities in Europe. We must treat any such attempt seriously and stand by the local Jewish community. I call upon the Bulgarian authorities to bring the attacker to justice quickly and to do everything in their power to prevent similar incidents in the future. The World Jewish Congress will continue to work to strengthen the security of Jewish communities around the world."